Shampoo Grapeology is a new generation shampoo that gently cleanses the hair while nourishing and moisturizing. Its formula with natural grape seed oil contains a high content of Vitamin E, protein and arginine, which repairs and improves the natural shine of the hair in addition to providing strength and elasticity. Its high content of antioxidants protects the hair against external agents and decreases aging. Ideal for people with sensitivity to other shampoos for its softness and purity, Grapeology Shampoo allows frequent use in all washes if necessary. 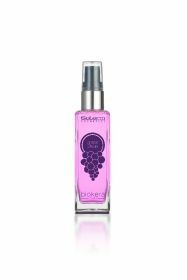 Moisten the hair with warm water and apply the Shampoo Grapeology distributing well. Rinse and repeat the process, leaving a few minutes of exposure time and rinse with water.